Elegantly nestled among breath taking rice terraces around the village of Pererenan and situated a few hundred meters away from the world famous Echo Beach, Villa La Novellina was designed to deliver a private, relaxing and secluded natural environment and, at the same, to offer all the services (and more…) typical of a hotel. The Villa is entirely air-conditioned and features 2 en-suite bedrooms, spacious living room with views of rice fields, fully equipped kitchen, garden with private pool and gazebo, unlimited WiFi Internet access, car with driver, personal chef, free use of bicycles, free use of mobile phone with local SIM card, housekeeper and in villa massage and spa treatments. With also being a short distance away from most of the fine things that Bali can offer, Villa La Novellina has all the ingredients to be the perfect destination for an unforgettable holiday in Bali’s tropical paradise. Main Living Area (Semi open-air living area, Air-conditioning & ceiling fan, Television & DVD player, Indoor bar facility). Bedroom 1 (Ensuite bathroom with bathtub, King size bed, Air-conditioning & ceiling fan, Television with DVD player, Sofa, Toiletries, Wardrobe). Kitchen and Dining (Microwave, Full-size refrigerator, Dishwasher). Services Performed by Staff Villa (Manager Villa, Supervisor, Butler, Housekeeper, Security, Swimming Pool Attendant, Garden Attendant). Swimming Pool Area (Private swimming pool, Swimming pool child safety fence available – charges apply, Bale’ (small Balinese gazebo, Poolside sunlounges with umbrellas). Welcome drink and fruit basket upon arrival. Shopping groceries arrangement for in-villa lunch and dinner arrangement. First day only Continental breakfast (max. 2 breakfasts per room). FREE usage Wi-Fi Internet access – guest’ personal laptop / device is required. Bedroom 2 (Ensuite bathroom with bathtub, King size bed, Air-conditioning & ceiling fan, Television with DVD player, Sofa, Toiletries, Wardrobe). This is no run-of-the-mill holiday villa. Villa Abida is a charming two-bedroom property with stylish interiors and quirky features. The villa exudes a warm, homey feel and it’s evident the moment you set foot inside that every motif and piece of furniture was chosen with careful consideration. The interiors are decorated with a stunning black and white colour scheme that stretches from the bright, spacious living area into the pair of ultra-comfortable bedrooms. Outside you’ll find a sizable lawn, garden and a large pool. The sheer size of the outdoor area makes The villa incredibly unique as it’s quite rare for a two-bedroom property to boast such a spacious garden. 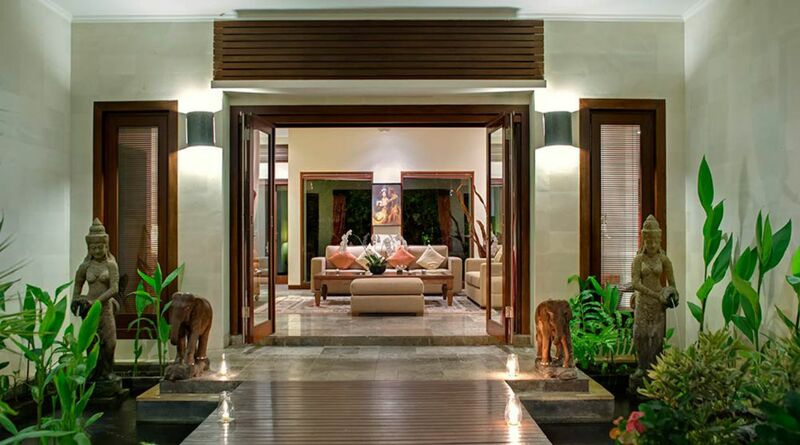 The villa is centrally located off Jalan Drupadi in the heart of Bali’s Seminyak area. It’s only moments away from Eat Street and its myriad of mouth-watering restaurants, swanky bars and charming little cafés. So head out and indulge in this world-famous luxury zone, or relax at home by the crystal blue pool as the fresh breeze rolls through. Villa Abida is the perfect place for a couple or a pair of traveling friends who want to stay in the midst of the excitement. The villa boasts a spacious living area on the ground floor. Large floor-to-ceiling windows allow natural light to bathe this gorgeous living space that’s been thoughtfully decorated with tropical plants, cacti and charming ornaments. A lovely, large L-shaped sofa lies at one end of the room, adorned with ornate scatter pillows. Beside the sofa are two impressive stools made from whole, solid tree trunks. A woven rug lies underneath, giving the lounge area a delightfully rustic yet exotic feeling against the white walls. Within the living area is a dining table that seats up to six adults comfortably. In the evenings, the table is illuminated by three quirky woven lamp shades that hang from the ceiling. There’s a fully equipped kitchen in an adjacent room so you can easily prepare meals within the comforts of your villa. A breakfast bar overlooks the kitchen and offers a delightful little spot for enjoying a quick snack or a nutritious breakfast before a day of shopping. Outside you’ll find a gorgeous rectangular pool. The two sun loungers beside it are perfect for kicking back with some tanning oil and a cold beverage and soaking up some rays. There’s a cozy little balé that’s been fitted with cushions and a mattress so you can enjoy a spot of meditation or midday snooze in the shade. There’s also a perfectly manicured little garden area with a table and two chairs. It’s a great place to enjoy a no-fuss meal on a breezy evening. Main Living Area (Semi open-air living area, Television with international channels & DVD player). Bedroom 1 (Ensuite bathroom, Queen size bed, Air-conditioning, Television with international channels & DVD player, Living Room, Toiletries, Walk-in wardrobe, Study desk, Terrace outside bedroom). Bedroom 2 (Ensuite bathroom, Queen size bed, Air-conditioning, Television with international channels & DVD player, Living Room, Sofa, Toiletries, Walk-in wardrobe). Bedroom 3 (Ensuite bathroom, Queen size bed, Air-conditioning, Television with international channels & DVD player, Living Room, Sofa, Toiletries, Walk-in wardrobe). Kitchen and Dining (Semi open-air kitchen & dining area, Fully equipped kitchen, Cutlery, chinaware & glassware, Full-size refrigerator, Dishwasher). Facility (Private pool, Hot water, Satellite TV, Internet wi-fi, Linen, Towels, 8hours Butler service). Inclusion (Flower Arrangement, Welcome Drink ). Services Performed by Staff (Villa Manager, Cook, Maid, Housekeeper, Swimming Pool Attendant, Garden Attendant). Airport transfers (arrival only), Welcome drink upon arrival, Flower arrangements in the villa upon arrival, Free Wi-Fi, Drinking water, Coffee & tea, Housekeeping service daily, Daily continental breakfast or Indonesia breakfast .